Texas has ended up in the top 10 states again. In this case, the news is not good. The Texas Office of Public Insurance Counsel (OPIC) reports that Texas has the third highest insurance rates in the nation. In fact, the OPIC compares the average rates paid by a homes valued between $175,000 and $200,000. 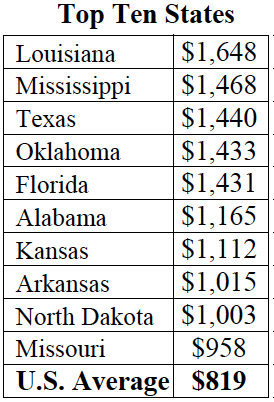 Texan’s paid an average of $1,440. That’s 76% higher than the national average. They ascribe some of the problem to “inefficient markets” and suggest that consumers spend more time shopping for different policies. That begs the question why the Texas market is more inefficient than those in other states and why company expenses, sales commissions, and company profits are higher in Texas than other states. OPIC is in a position to report these sources of higher premiums, but it is not in a position to regulate them. The bottom line (for the moment) is that state regulation is not going to bring down rates. If Texans want chapter insure it’s up to consumers to shop around. OPIC suggests using tools online at www.opic.state.tx.us or at helpinsure.com.